How to Have Fun in Wimberley, TX on a rainy day! Okay, it may be hard to convince the kids of this, but the ideas below may change their mind… maybe? Let us know in the comments below if you found any of these ideas helpful! A large pizza at Brewster’s is 20-inches of delish! 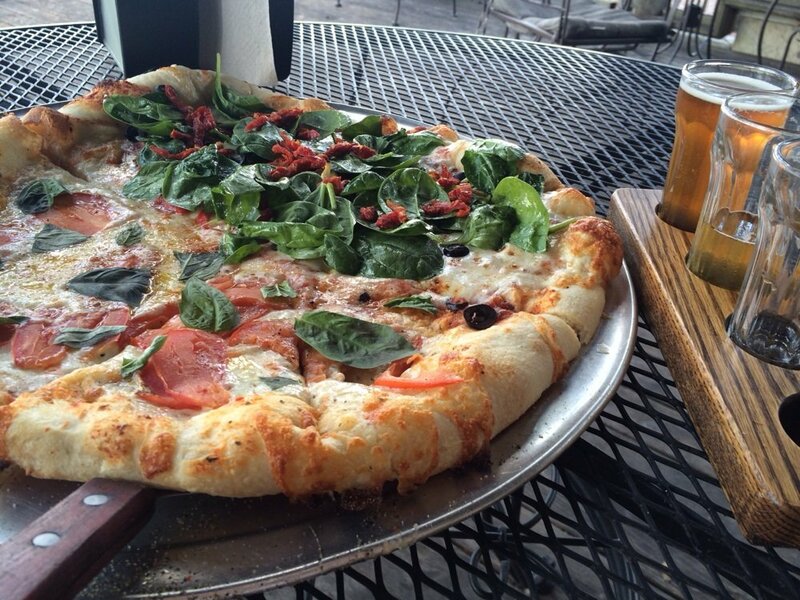 Brewster’s was voted Texas’s Best Family Owned Pizza Place in 2015 and I think their pizza is the best around. They have some pretty cool flavor combinations on their specials menu, plus lots of fresh veggies, fresh made sauce and a couple of different crust options – plus really great honey-glazed chicken wings. Brewster’s is run by a family of 15 so they know all about making it a perfect family friendly eatery! It is a great spot for kids with a couple of video games, a chalkboard and coloring table and an outdoor playroom under the porch, plus plenty of roomy booths! Oh, another plus, Brewster’s is owned by former Pro Football Player Bruce Collie who also brews his own beers. Drink a pint while you are there and take a Growler home! He’ll even show you his super bowl ring! This is such a fun and different experience and my kids enjoyed it every time we went. Watch as the owner demonstrates how he creates some of the beautiful art glass vases and other pieces they have for sale. There are benches set up in the workshop where he gives a very detailed demonstration – and it is warm and cozy in there! Take heed, the pieces in the studio can be very expensive so for antsier kids you may want to shuffle them in and out carefully! Get Directions and Hours for Wimberley Glassworks. This Wimberley treasure chest on the square has been around for decades and is a neat spot to spend an hour or two just browsing the tiny and not so tiny rocks and crystals. The staff is very knowledgeable and enjoys sharing their knowledge about all the different rocks, minerals and crystals and how they were formed and where they came from. Great rock souvenirs for the kids too! They have books and gifts. Call and check to see if they are open. 512-847-2282. Downtown Wimberley has a ton of treats and snacks – some for now and some you can save for later! Papa Hoo’s Popcorn has at least 50 flavors of made-on-site popcorns. Try the Zebra!!! (O. M. G.) Try the samples and choose your favorite for now and a large bag to take home. They also have “fancy” sodas and gourmet root beers, plus specialty candies and custom gift baskets. 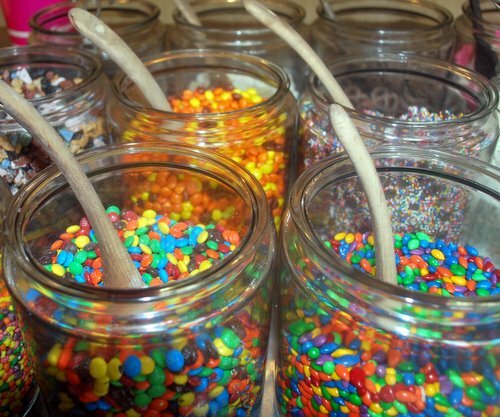 The Wooden Spoon is a downtown frozen yogurt shop with all the toppings you can imagine! My favorite is the Georgia Peach with graham cracker crumbs. Mmmmm. The Wimberley Way has Amy’s Ice Cream in several flavors, including their popular Mexican Vanilla. Also located downtown is SIP! – a great little coffee shop where you can grab specialty coffees and Italian sodas plus treats from the best little bakery in Wimberley located about 1/2 a mile around the corner on River Road – Sugar Shack! And finally, be sure and stop by the famous Wimberley Pie Shop for a slice of warm apple, peach or cherry pie – better yet, take one home. From fruit pies and cobblers, chocolate, pecan and key lime, plus brownies, quiche and even dog treats – you don’t want to miss this Wimberley favorite! Ace Hardware and Gifts has Wimberley covered for last minute, forgot-to-grab in town fun supplies. Floats, sunscreens, swimsuits, towels, Yeti Coolers, and more for all your sunny day fun, but on a rainy day you can stop in for puzzles, board games, crafts and unique toys! They also have fresh, hot popcorn and fountain drinks! For movies, if you have a DVD player in your room, you can rent at the local Red Box in front of HEB. Why not? You are on vacation right? That’s what country life is all about – playing outside. And sometimes you just have to splash awhile! Grab some ponchos and rubber boots (also available at Ace) and let them go wild. If you are in one of the many vacation rentals in town you probably have a yard full of puddles. If not, you can always head to Blue Hole trails and take a walk through the trees to one of the little creeks (don’t play in rushing water of course) or head up to the playground and soccer field. I guarantee the kids will remember this trip to Wimberley, Tx forever!